This article explains What is recycling 7 reasons why we should recycle. What is recycling? As we begin this blog, I thought I might start with the basics and begin with a working personal definition of recycling. Recycling as a word has become so ingrained into our language and to a certain extent, in the very fabric of our multi-cultural society. Today, 110 years after the first materials recovery plant was established in New York, it is extremely encouraging to note the steady increase of solid waste recycling in the US, over the last 4 decades. The US Environmental Protection Agency (EPA) estimates our average (across different products and industries) recycling rate to be 32.5%. What happens to the remaining unrecycled waste? The EPA explain that 12.5% are burned in incineration facilities (spewing hazardous emissions to the atmosphere) while the remaining 55% (well over half of the estimated 251 million tons of solid waste we produce in a year) are deposited in the landfills throughout the country. Quite clearly, there is a huge room for recycling to grow in this country. What is recycling? Why recycle? “Reduce, reuse, recycle” is the mantra we often hear everytime there’s a discussion about recycling . Reducing waste means not only to reduce the volume of waste that goes to the landfills, but it also means decreasing the amount of dangerous chemicals that seep into the soil and pollute the air due to improper waste disposal. Reuse is basically extending the usage of most of the items we have in the house by reusing or donating these items to others in a free recycle group, for example. To complete the cycle, we must do it as part of our lifestyle to purchase and use products made from recycled materials. We cannot sustain our consumerist lifestyle without getting inundated by garbage and exhausting the earth’s resources. The products that we use are wrapped in several layers of packaging material that are perfectly recyclable – plastic, aluminum, paper, tin, wood, etc. Solid waste disposal experts engage in an uphill struggle to contain this virtual avalanche of garbage we produce everyday. It is apparent that digging a hole, a landfill, is clearly not the answer. Sooner or later, the waste becomes uncontainable and will spill into our farming areas, forests, and water sources. 1. Financial Income – There is money in recycling. In the level of the individual, one of the benefits of recycling is financial income. There are a lot of things lying around the house that we no longer want or need that might just end up in a dumpsite somewhere, that we can recycle and earn money from. Cell phones, PDAs, ink cartridges, etc. Here at PaceButler, for instance, a phone sent in for recycling could net the owner as much as $50. There is also the financial benefit for the communities who recycle in that there will be reduced costs of waste disposal or recycling. You think recycling is expensive? Consider these recycling facts: aluminum cans are the most valuable item in your bin. Aluminum can recycling helps fund the entire curbside collection. It’s the only packaging material that more than covers the cost of collection and reprocessing for itself. 2. Recycling helps conserve limited resources – Throwing away a single aluminum can, versus recycling it, is like pouring out six ounces of gasoline. Last year, Americans recycled enough aluminum cans to conserve the energy equivalent of more than15 million barrels of oil. 3. Recycling is energy efficient – On a larger scale, recycling could translate into huge reductions in our energy costs. Consider these facts: It costs more energy to manufacture a brand new aluminum can than it does to recycle 20 aluminum cans. 20 cans can be made from recycled material using the same energy it takes to make one new can. 4) Recycling builds community – In almost all communities in the country today, there is a growing concern for recycling and the environment. People are working together in recycling programs, lobbies, and free recycle organizations to help promote recycling. We will be featuring these groups in our upcoming posts and link with the various networks to help you locate the nearest recycling center or free recycle group nearest your location. 5) Recycling creates jobs – Incinerating 10,000 tons of waste creates one job; landfilling 10,000 tons of waste creates six jobs; recycling 10,000 tons of waste creates 36 jobs. 6) Recycling builds a strong economy – Done on a nationwide scale, like what we’re doing here in the US, recycling has a huge impact in our economy in terms of jobs, energy cost reduction, resources conservation. Lately, as the price of oil hits close to $120 a barrel, people have become more aware of the huge impact of recycling, particularly in reducing plastic waste material coming from the bottled water and beverage industry. We will be discussing this in detail in our future posts. 7) Recycling is Earth-friendly – No matter how safe and efficient our landfills are being billed to be, the possibility of dangerous chemicals coming from the solid waste deposited in these landfills, contaminating underground water supply is always present. Combustion or incineration of our solid waste is effective and energy-generating, but we pay the price in increased air pollution. Recycling for each of us is a matter of choice. Remember the recycling model reduce, reuse, recycle? 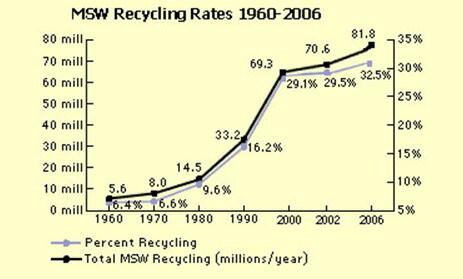 America today has one of the highest rates of recycling anywhere in the world. And yet if we consider the amount of trash that ends up in our dumpsites, I’m amazed at this vastly untapped opportunity for us – there is still so much amount of good that we can do. The Environmental Protection Agency estimates that we can recycle as much as 85% of our total waste if more and more people become aware of the benefits of recycling and take action. There’s plenty that we can recycle here. But the paper scrap, or the plastic bottle won’t recycle itself. It’s up to you and me to make that conscious choice to recycle. Recycling works best if everyone contributes his or her share in the recycling effort. 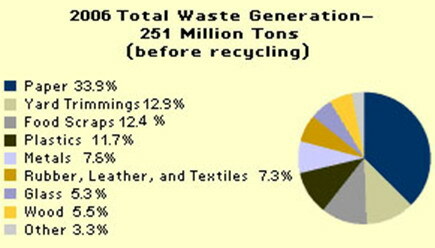 The Environmental Protection Agency estimates that we can recycle as much as 85% of our total solid waste. If you or I make that decision and choose recycling, it shouldn’t be because politicians passed a legislation compelling us to do it. It’s because out of free will, we choose to, knowing that recycling is the right thing to do. Recycling is a way of life. Once we have made that choice to implement all the steps of recycling in our daily lives, and stick to that choice every single day, recycling becomes second nature to us. Sure there will be lapses, it’s not easy for us creatures of habit. But no matter, we press on. Every small contribution to the recycling movement and the initiative to protect our environment adds up to how our present society eventually shapes our nation’s and the Earth’s future. What is recycling to you? View more presentations from Mike Arms. View more documents from Mike Arms. Recycling Business from Home, Let’s Give It A Try – There is money in waste. That’s a little known secret that in times when rumors of recession are rampant, may just be useful to all of us. extremely well written articl.. I agree with you fully, recycling is a way of life. I like number 5 & 6 best.. as i know for a fact you recycling creates job.. hell i’m employed by a plastic recycler right now..
this article is really helpful. helped with my presentation in class.appreciate. really helped me with my scrapbook. I was intrested to be part of this business. Will you please tell me who are the buyers of the recyled materials ? eg. computers. Fabulous article, I’m all about recyling and there were a few more ways in here. My parents grew up in the depression and we grew up going green. Amen, keep up the great work for our earth and each other. Many kudos to you and all who recycle. can u please send it on my email id i.e. EPA has changed the comment period for public definition of solid waste. ACTION: Notice of Public Meeting and Request for Comments; Extension of comment period. SUMMARY: EPA is announcing an extension to the comment period for the public meeting notice published in the Federal Register on May 27, 2009 regarding the Agency’s recent regulation on the definition of solid waste under Subtitle C of the Resource Conservation and Recovery Act (RCRA). The comment period is being extended 30 days to August 13, 2009. EPA is currently reviewing a petition filed with the Administrator under RCRA section 7004(a) requesting that the Agency reconsider and repeal the recently promulgated revisions to the definition of solid waste for hazardous secondary materials being reclaimed, and is soliciting comments and information to assist the agency in evaluating the petition. DATES: Persons may submit written or electronic comments by August 13, 2009. The administrative record of the meeting will remain open for submissions until August 13, 2009. Great article! I recycle clothing into handbags and other accessories and it has proven to be quite fulfilling for me. Excellent compilation of all the reasons and benefits of recycling. Thanks for the slides and PDF formats, really helped my daughter with an assignment.